I did say to keep the cooking liquid, as it may come in handy elsewhere. And guess what? You just landed in Elsewhere! (Not St. Elsewhere, for any readers old enough to understand that reference. The Brat Pack, et al. Where are they now?) If you didn’t make the first dish (I’ll try not to be hurt about that), then just use your favorite beef or chicken stock. But homemade stock is what makes this pho amazing, and I’m lucky to have a freezer shelf dedicated to it. I don’t know why I hoard it so much. I can make more whenever I want! Maybe I’m a survivalist at heart? I just finished reading World War Z, so maybe I’m preparing for the apocalypse. And if so, chicken stock is probably not the wisest thing to have a ton of. C’mon Jennifer, think smarter! And I would be very remiss to not mention my lovely friend Chau who introduced me to the deliciousness of pho while she was first my intern, then my employee. She taught me that the word pho rhymes with “duh”, which is easy to remember, but I never did get her mom’s recipe out of her. Chau is awesome, and if I could, I’d still have her on my business team, but she’s gone on to bigger and better things. And hey, if you want to share that recipe, Chau, I’ll be all for it! So this is probably not a true pho, but it is tasty and warming, and The Husband and I gave it a thumbs up. He was skeptical that the spaghetti squash would work instead of rice noodles, but he trusted me. And it worked really well! ++Vegans/Vegetarians: Why not try this with vegetable or mushroom stock, and use seitan or tofu instead of the duck? I think it would be delicious! **If you don’t have the broth from the pork recipe, make your broth using this recipe, or whatever pho recipe you like best. First get the spaghetti squash in the oven at 350° F, and bake it until the “noodles” inside are still a little al dente. Then rub the duck breasts with almond oil and season with the five-spice, salt and pepper. Heat the broth and stock with the star anise, peppercorns, chilis, garlic, cinnamon and mushrooms. If you’re smart, you’ll put the spices and chilis in a little muslin bag so that you don’t have to fish them out later. I hope that next time I take my own advice, as there’s nothing that kills your pho buzz like biting into a star anise. Ai yi yi. Let simmer. Prep your garnishes and set out for the table. 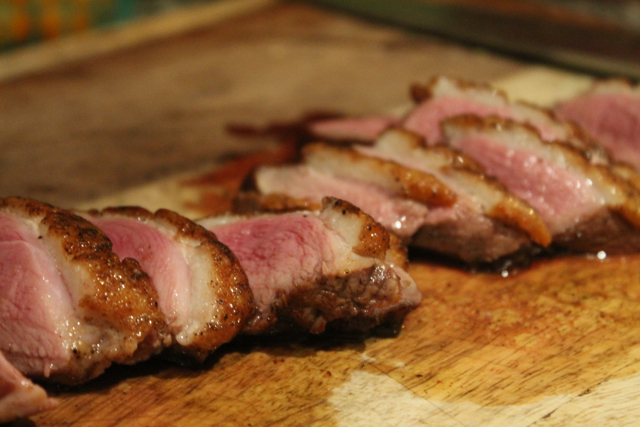 Now you can sear your duck. Don’t do it too early so that your soup and spaghetti squash isn’t ready when the duck is, otherwise it will go cold and everyone will be sad. Heat a non-stick pan to smoking hot. I’m using these Scanpans at the moment, and they’re amazing. Thanks to the Danish, the makers of this fine product, the non-stick stuff won’t kill you even if you use metal utensils. Plus, you don’t have to use any fat in the pan, and I didn’t with these duck breasts, because they created quite a puddle of their own. Sear the duck fat side down for three minutes, or until very brown. Flip over, and continue cooking for another three minutes. Hopefully this is the time you take your spaghetti squash out of the oven, because you can turn the oven off and set your duck breasts in to finish cooking through. Pull the spaghetti squash away from the sides of the outer skin and portion out into bowls. Add the broth on top of the squash. Remove the duck from the oven (being quite sure that you use a hot pad to grab the frying pan handle, unlike me) and check to make sure they’re cooked through. Slice each breast on the diagonal. 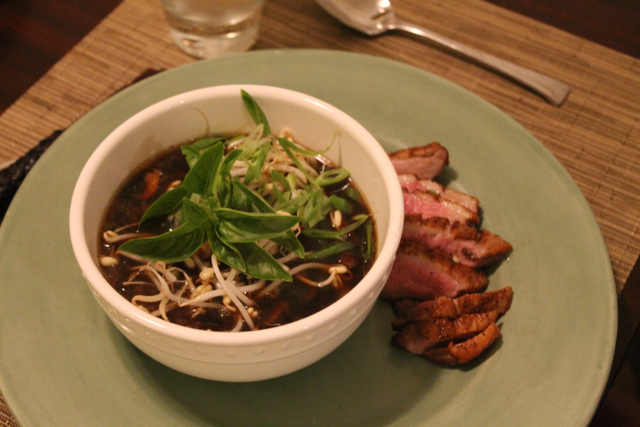 Place bowl on a dinner plate and add the duck breast to the plate. Serve with garnishes, chopsticks and a spoon. Although Pho isn’t my favorite and I won’t be killing a duck anytime soon, I love reading your posts. Your humor always makes me smile. 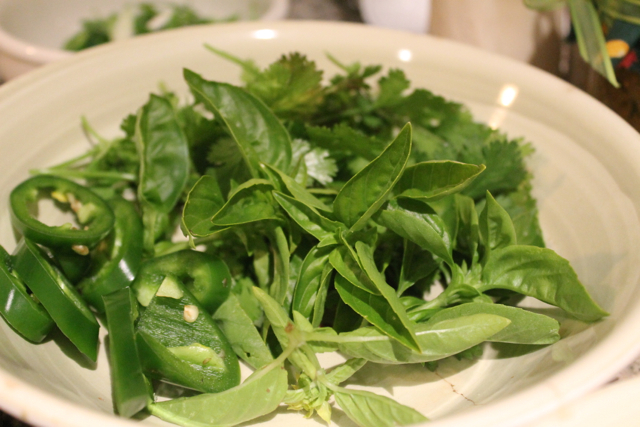 I love pho, I love cilantro. Thank goodness I got the enzyme!! Love the title of your cook book, especially the subtitle. I’ll buy the first copy! This is my kind of dish. I have not cooked with duck yet, but maybe this recipe will be a first for me. And I was scared to try duck too, but it’s quite easy. I think the only thing to watch is overcooking it, which is why the time in the oven is so important. Just to let you know, I would happily buy the cook both from both of you lovely ladies! 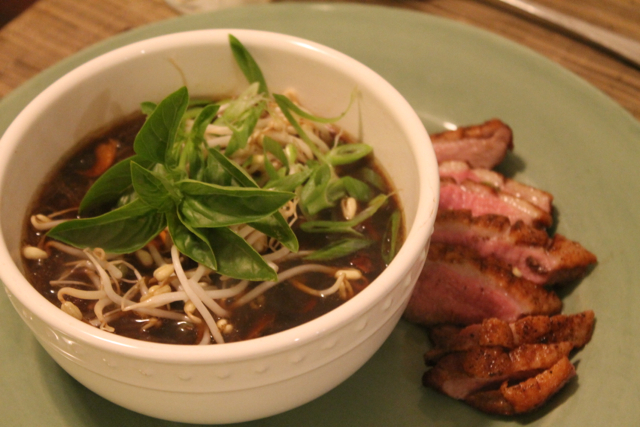 This recipe is phenomenal and I love the idea of a Duck Pho. Fellow coriander fiend here!!! Thank you so much! Always great to hear such a fine compliment from a great chef like you. Likewise!!! I’m always worried I might not have suitable foods/recipes as (I know) you’ve got limitations to what you can eat. Nonetheless, you always find such great solutions to your own recipes & substitutions. The Pho was amazing in Vietnam. Even in 35-40C heat, we’d sit down to great big bowls of this and sweat it out with chilli, it was that great! The aroma of this dish has be be wonderful. I must admit, it does fill the kitchen with a delicious aroma! Thanks for the note! I hope you do! The duck had such a different flavor from beef. Thanks for the note!